Every successful business starts with an idea. That idea is then supported by research and planning. Following the steps of research and planning, marketers and managers must survey the market, gathering information data and statistics on the market and industry the business affects. You must study your product and service, competition, and marketing trends. The more you know about your business and your industry, the greater your chances of succeeding in the marketplace. One great tool to use to aid with this process is the SWOT Analysis Checklist template. The SWOT Analysis Checklist is a system business planners use to gather info about your businesses Strengths Weaknesses Opportunities and Threats. When starting a SWOT analysis, brainstorm different factors revolving around your business as you get started. 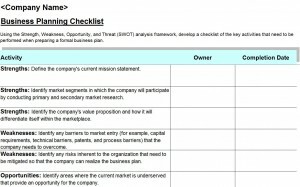 This template will be used as a checklist of necessary activities that need to be performed as you carry out your company mission. Download template from this page free of charge. Customize your document by filling in information about your name, business, logos or anything else that brands your business. Save as you go. Set appropriate fields needed to keep your information organized. As you get started, you’ll notice how simple it is to enter information and edit or add features to your document. Keep your information organized, make sure that you know the difference between strengths and opportunities, and the difference between threats and weaknesses. Always remember you can edit context. The information you enter can always be updated. Use the customization’s to produce a more unique document. Use colors to distinguish information and make your document easier to sort through. A SWOT Analysis usually analyzes and summaries a business plan. Keep it Short and Simple. Use numerical fields for graphs and calculations if necessary. Proper planning prevents poor performance. Microsoft office has a variety of templates to assist business with tasks from accounting and book keeping to strategy and planning. Using templates, you can save time and effort on routine and complex tasks. Planning and research are keen tasks for companies looking to stay competitive. A SWOT Analysis Checklist will help you develop and implement your business plan in order to meet or exceed company goals. Get started with a few clicks and a swift download!